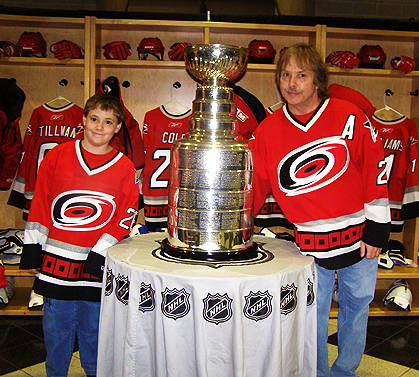 In June, 2001 and again in December, 2006, The B-Man and I got to see the Stanley Cup in Raleigh at the RBC Center. It is indeed as impressive as everyone says. According to legend, you are only supposed to touch it if you win it; if you touch it before winning it, you'll be jinxed and never will win it. Since I'm now beyond the age of ever being able to play, I decided that it was OK for me to touch it (and, as you can see in the picture, I did!). However, since The B-Man hopes to win it someday, I was very careful to hold him on the opposite side of me and he DID NOT touch it. 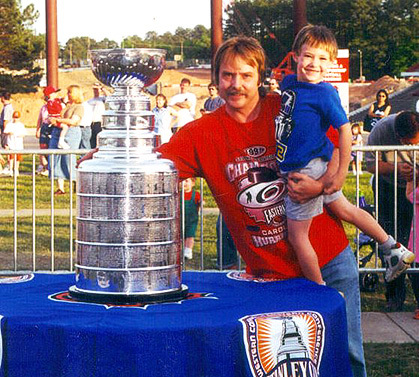 So hopefully he will be on a winning team and get to hoist it one day. Cross your fingers!